FILE - People wait for garment workers to leave a factory in a suburb of Phnom Penh. Relations between Cambodia and Vietnam have been sorely tested in recent years by border disputes and their starkly different positions on Beijing's maritime ambitions in the South China Sea. Now those ties are being aggravated by a dramatic slump in foreign investment. Foreign direct investment (FDI) from Vietnam into Cambodia fell to almost zero in the first half of this year, a revelation that stunned many in business, government and civil society. No comparable figures were given by the Council for the Development of Cambodia (CDC), but Vietnam had ranked fifth among Cambodia's investors after China, South Korea, the European Union and Malaysia. The collapse also came as local reports said Cambodia's foreign ministry had sent more than 20 diplomatic notes complaining that the Vietnamese had not halted the construction of buildings within a designated no man's land along their common border. Border issues and investment also topped the agenda as high-level delegations from Phnom Penh and Hanoi met here over the past week, but no joint statements were released, which analysts said indicated a lack of agreement. “The Vietnamese and the Cambodians are sort of in polar positions,” said Keith Loveard, a regional security analyst with Concord Consulting. He said Vietnam was increasingly the place to go for FDI and it “is picking up an awful lot of Western business”, partly because of its proximity to the Chinese market and as China becomes more expensive, Vietnam is becoming more attractive. “On the other hand Cambodia is increasingly locked into this Chinese embrace and it finds itself rather at odds, with Laos perhaps sort of sitting quietly as always in the background, as very much an outlier within ASEAN,” Loveard added. Analysts had warned Cambodia could face 'pay back' from other members of ASEAN after Phnom Penh backed Chinese maritime claims across islands and waters in the South China Sea, which are also claimed in part by Brunei, Indonesia, Malaysia, The Philippines and Vietnam. Beijing wants those disputes resolved on a bilateral level with each, individual claimant. But Vietnam has led an ASEAN push to told hold talks on a multilateral basis – opposed by Cambodia at China's behest. In return, Beijing became Cambodia's largest benefactor putting at risk a trade relationship between Vietnam and Cambodia worth billions of dollars. 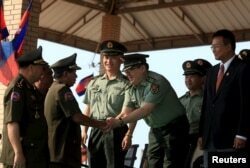 FILE - Cambodian Defense Minister Tea Banh, second left, shakes hands with a Chinese army adviser during a graduation ceremony at the Army Institute in Kampong Speu province. Cambodia has backed Chinese maritime claims across islands and waters in the South China Sea. At the latest ASEAN summit in Laos in early September, Cambodian diplomacy succeeded in watering down an ASEAN communique aimed at tackling Chinese claims, a move that aggravated some of the other members of the 10-nation ASEAN trade bloc. According to the CDC, bilateral trade in 2015 hit $3.37 billion, with Cambodian exports to Vietnam amounting to $954 million and imports at $2.41 billion. The figures were released as a series of meetings got underway led by Nguyen Thi Kim Ngan, Chairwoman of the Vietnamese National Assembly, who led a 72-member delegation to Phnom Penh. As they ended, the Cambodians tried to reassure reporters that both countries would work to 'maintain their close relationship' amid competition from world superpowers, widely interpreted as a veiled reference to their differences over Chinese maritime claims. But Cambodian spokesman Keo Piseth also noted the Vietnamese delegation had aired concerns about investing near their shared, 1,228-kilometer land border, where demarcation disputes have persisted in recent years, and at times have turned ugly. “Vietnam also asked Cambodia to support and protect legal Vietnamese companies that are investing in Cambodia,” he said. Vietnamese delegates remained tight-lipped about the meetings, declining to comment. Instead, its official media focused on Ngan's meetings with Cambodian King Norodom Sihamoni and Say Chhum, President of the Cambodian Senate, reporting that both sides were hopeful of settling the remaining issues along their shared land border. Analysts and civil rights advocates said problems persisted with Vietnamese companies operating in Cambodia, which ignored government policies and had not met their corporate obligations with the local communities. This had led to protests over issues ranging from land grabbing to control over water and might have contributed to the sharp fall in FDI coming from Vietnam. “For Vietnam, from our experience, we don't have any common standard between the civil society and the Vietnam Chamber of Commerce, so we hope in the future we can work together and to develop the common standards and common guidelines that encourage the solving of people issues,” said Tek Vannara, the Executive Director of NGO-Forum.